Welcome to Wow Us Wednesdays. I am so glad you have chosen to party with me. Are y'all having a good week so far? We are having beautiful warm days now with above normal temps. I can handle that for now, but dread when it gets really sticky out. On the blog front there are issues with blog posts not being delivered by subscriptions. This is throughout blog land and I know many of you have emailed me about this. All I can say for now is the next best way to get blogs delivered to your inbox would be to follow through bloglovin. It is the heart shaped icon on my sidebar in my social icons and at the end of each post. All blogs you follow through that will come to your inbox. So sorry there is a glitch with the subscriptions. Believe me I don't like it one bit. I wanted to thank y'all for the sweet comments about the sun room's new look that I shared Monday. There were lots of great links last week and here are a few highlights. 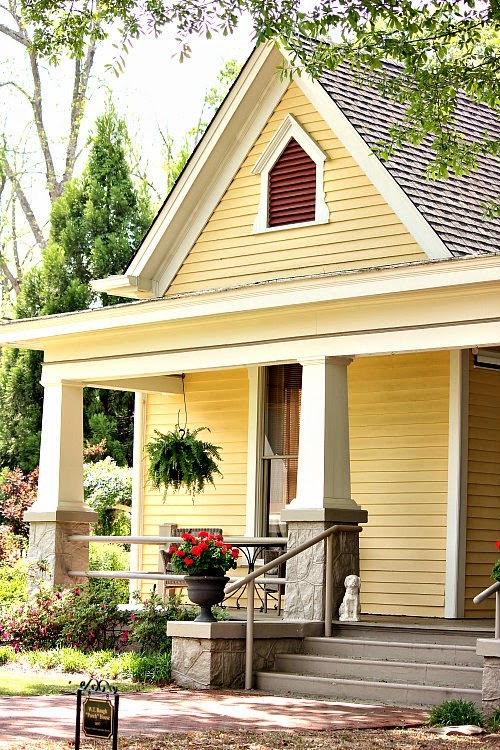 The Porch House in Madison, Ga. was shared by Olive Out and was the most viewed link. 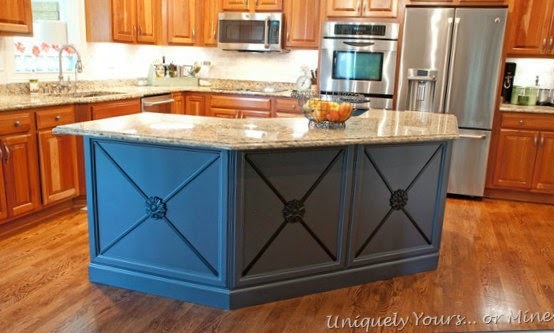 Uniquely Yours Or Mine transformed their kitchen island from ho hum to fabulous. A nice shady spot was created to sit and relax by their pond, but was a lot of back breaking work to get there. See how it was made step by step by Our Adventures in Home Improvement. 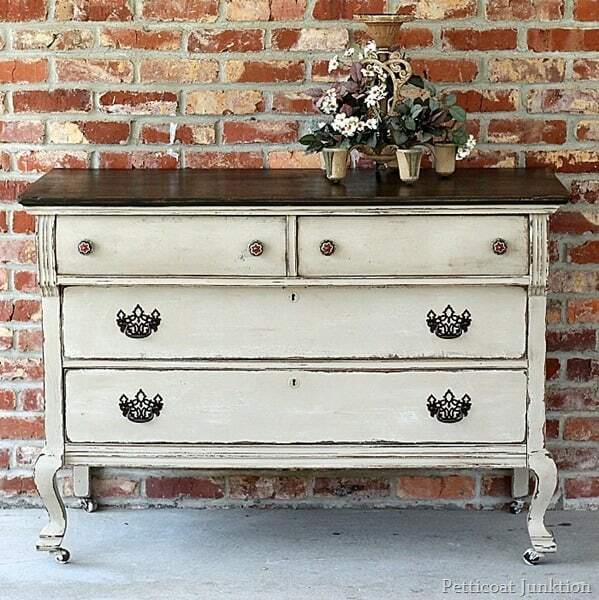 Petticoat Junktion shares 10 steps for painting furniture and she always does fabulous work. 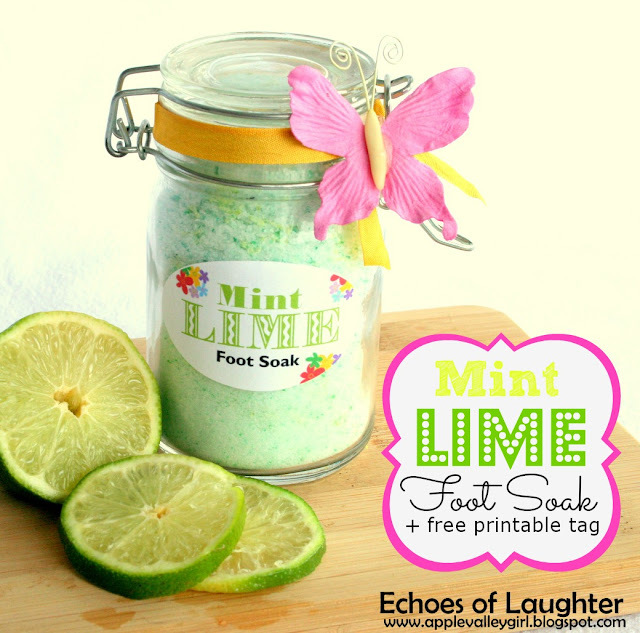 Find out how to make this mint lime foot soak and get the free printable tag by Echoes of Laughter. This would make a nice Mother's Day gift. The Charm of Home shared this beautiful angel food cake that is just too pretty to eat. Thanks to everyone who joined last week. If you were featured you can grab a featured button from my sidebar. Now, let's not waste anymore time and get this party started! Thanks for hosting Kim. Love your party each week. So glad you are having nice weather, Kim. Thanks for hosting each week! Thanks for hosting, Kim I agree with you about that Angel Food Cake. It's a work of art! Great features...I love that you feature many different "subjects" from DIY, to recipes, to beautiful makeovers!....Thanks for hosting Kim! Have a great evening! Thank you for hosting! I love looking through the pretty the links! p.s. come see my red kitchen cabinets :) I think you will approve, lol! We are getting some warmer weather in NJ too - finally! Thanks for hosting Kim! Great features, love that kitchen island! Thanks for hosting every week, Kim! They're all fabulous features! Thanks for hosting us Kim! Thanks for all the picks and work each week in hosting, Kim. Those boulders in that backyard oasis look like they'd be back-breaking, for sure, but oh so nice! Kim, glad you are enjoying some nice weather. They say rain is headed our way. That would be welcome! Such great features Kim and they all have beautiful photos! Thanks for hosting. So sorry you're having email issues with your blog! How frustrating!! Hope you can get it fixed soon. Glad you're at least able to enjoy the warmer weather. Thanks for hosting, Kim! Thanks Kim - Appreciate what you do! Thanks for hosting Kim!! Email issues over here too~ ugh. Thank you so much for hosting Kim. Have a nice week. Thanks for the feature Kim! I love the colors you have in your sunroom. It is a great space! Thank you Kim! It is always such a great party! Oh Kim, You are so sweet. Thanks for the kind words and for featuring my 10 steps to prepping and painting furniture. Email issues here too. It's always something isn't it! Thanks so much, Kim! Loving the crisp new look in your sunroom! Thanks for hosting, Kim! I'm loving your sun room! So bright and cheery! Have a wonderful week. Your sunroom is beautiful, Kim! Thanks so much for hosting! I am just crazy about your gorgeous sunroom, Kim, it's awesome. I always enjoy the wonderful featured blogs when I drop in to party! Always a treat. Thanks for hosting again! What wonderful inspiration. Thanks for hosting Kim. I absolutely adore your new touches in the sun room. Thank you for hosting! Thanks so much for hosting, Kim! Gotta love all the featured posts! Now off to visit! Thanks so much for the fabulous party, Kim! Happy Wednesday to you!! Thanks so much for hosting. The sun porch is wonderful and those curtains and the pop of red! love it! Thank you for hosting Kim, I do love the petticoat junction makeover of the sideboard. I like the dark chippy bits showing through.